Downpatrick got the result and performance they wanted in their Irish Cup second round match against fellow 1A challengers UUJ on Saturday. Downpatrick’s Stephen Galbraith puts the UUJ defence under pressure. 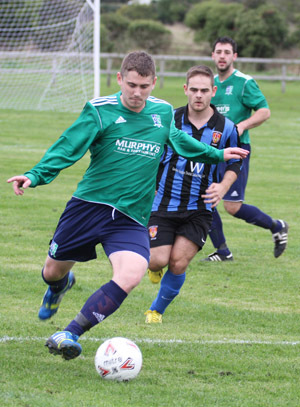 Top goal scorer Stephen Galbraith had the perfect opportunity to get the hosts off to a flyer in the fifth minute when he got on the end of a sweet delivery from Barry Treacy but his headed effort skimmed the post. For periods, UUJ look impressive, confident and fit. But manager Shortie Trueman’s cunning plan eventually put an end to that. Galbraith had an even better chance just three minutes later when the striker went one on one against the keeper who found himself in no man’s land but his lob drifted over the advancing keeper and the crossbar. Conor McKenna found Treacy with a lovely floated pass the ace winger looked set to nail but his header went wide. Even though the locals playing good football were dominant over the visitors, they couldn’t get on the score sheet and went in at half-time 0-0. The second half was only two minutes old when the first piece of action came but unfortunately it was for two red cards. 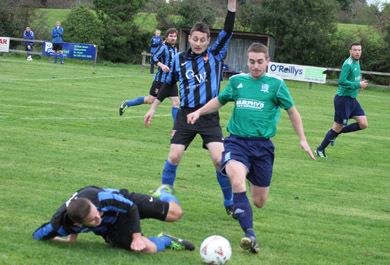 Downpatrick midfielder Conor McKenna clears the ball after a UUJ attack. One for the UUJ player lashing out at Blaine Connolly and one for Connolly’s reaction. With both teams down to ten men it was about who would react best. Downpatrick really kicked on and the pressure told in the 53rd minute when Galbraith rounded the keeper and was dragged to the floor. The referee had no choice but to award the penalty and show a red card to the keeper, after lengthy protest, Galbraith kept his cool and slotted home and in truth there seemed only one outcome likely. The introduction of Andrew Telford immediately paid off as he set up Galbraith minutes later for his and Downpatrick’s second. The goal of the game arrived through the midfield work horse Mathew McGarrity, his trademark run was spotted by Telford. He took it on his chest and planted a perfect lob over the stand in keeper. Telford then showed he not only assists with goals as he got himself on the score sheet when turning the defence inside and out before driving the ball to the roof of the net. UUJ’s limited attack was dealt will all afternoon by Mark Curran, Ciaran McGarrity, Terence Bell and goal keeper Conan Russell and when Terence bell run 60 yards to finish 1st time into the bottom corner it summed up a truly great Irish Cup win for the Downpatrick locals. Downpatrick team: 1) C Russell 2) T Bell 3) B Connolly 4) M Curran 5) C McGarrity 6) C McKenna 7) B Treacy 8) M McGarrity 9) S Galbraith 10) N Young 11) C Mullan 12) A Telford 14) G Trueman 15) M Carson 16) B Fitzsimons 17) C Kerr.